searching the professional literature. Stage 2 explains how to find good research topics and define them clearly for presentation to faculty advisors.Stage 3 describes problems often encountered in data collection and suggests solutions for those problems. At Stage 4, students learn ways of organizing and interpreting information, including classification schemes, verbal and statistical summaries, and methods of deriving meaning from data. 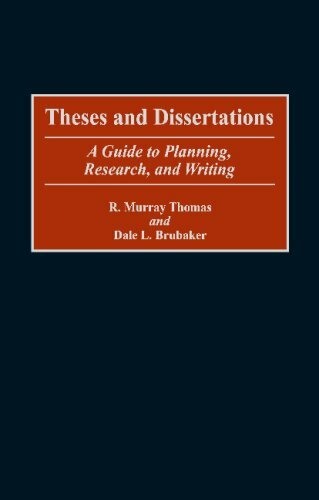 The final stage, Presenting the Finished Product, offers guidelines for thesis and dissertation writing and for publishing the results in such media as books, journal articles, and popular periodicals. Stage 5 also includes a chapter about how students can mount a convincing defense of their work during a faculty committee's final oral examination session. Tracey Steele is an associate professor of sociology at Wright State University. Her current research focuses on the construction of gender and sexual identity. Her most recent work explores how gender affects attitudes towards capital punishment.R. Murray Thomas taught for 32 years, before retiring in 1991. He is the author of over 300 publications and has published 48 books. His research interests include moral development, folk psychologists, and international education. Dale L. Brubaker is Professor of Education at the University of North Carolina at Greensboro. He has also served on the faculties of the University of California, Santa Barbara, and the University of Wisconsin, Milwaukee. He received his doctorate in foundations of education from Michigan State University. He is the author or coauthor of numerous books on education and educational leadership, including CREATIVE CURRICULUM LEADERSHIP (Corwin), STAYING ON TRACK, (Corwin), and CREATIVE SURVIVAL IN EDUCATIONAL BUREAUCRACIES.